The Great Recession and its European extension with the sovereign debt crisis and the fiscal adjustments undertaken in several Eurozone countries have rekindled attention on the issue of the effectiveness of fiscal policy. 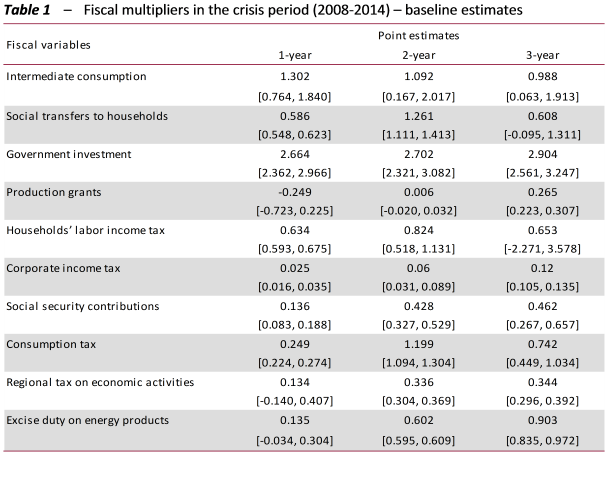 The Working Paper “Fiscal Multipliers in Abnormal Times: the Case of a Model of Italian Economy” verifies whether the 2008-2014 crisis has affected the size of fiscal multipliers and examines the effects of fiscal policies implemented in Italy by adopting the estimated multipliers specific to the crisis period. Prior to the crisis, the consensus view considered discretionary fiscal policy (i.e. fiscal policy aimed at influencing the short-term performance of the economy beyond the action produced by automatic stabilisers) to be a less efficient instrument for governing the business cycle than monetary policy. This view emphasised the role of several factors: a) the normal lags that affect decision-making and implementation of fiscal measures and the risk of interference with other policy goals; b) the success of monetary policy in stabilising economies in the so-called “Great Moderation” era, so that there was no need for an additional adjustment instrument; c) a certain scepticism about the effects of discretionary fiscal policies, also in relation to changes in the expectations of households and firms; and d) the view that in economies facing challenges in ensuring the sustainability of the public finances, the priority task of fiscal policy must be to stabilize or even reduce the level of public debt. Even on the basis of these considerations, a large majority of analysts and policy-makers at the beginning of the decade anticipated somewhat limited and short-lived effects from the fiscal consolidation plans that various Eurozone economies had to implement in a narrow window of time in order to respond to the sovereign debt crisis and the wave of financial panic. However, the consensus view on the conduct of fiscal policy was dependent on the realization of general conditions that hold in normal times, but which failed to materialize in the exceptional circumstances of the crisis. In particular, fiscal consolidation programmes were adopted in economies that had not yet recovered from the previous severe recession and were thus in a condition of considerable cyclical weakness. Under these conditions, monetary policy quickly became impotent in stabilizing the business cycle since central banks (and particularly the ECB), having cut policy interest rates to zero, could not go much below this lower bound to try to counteract the negative impact of fiscal consolidation on economies. Quite the contrary, the deflationary impulses that accompanied the recessions induced by austerity plans tended to raise real interest rates, increasing further the gap from the already declining equilibrium levels compatible with full employment. Moreover, the impairment of the operation of financial systems increased the share of financially constrained households and firms reacting to the fall in income caused by the recession more rapidly than in normal times. On the top of that, fiscal adjustments were implemented simultaneously across Europe, even in countries that were not facing confidence crises, probably intensifying the transmission of recessionary effects among countries with strong trade and economic links. In a 2013 paper, the IMF economists Olivier Blanchard and Daniel Leigh show that, due to the underestimation of fiscal multipliers based on pre-crisis developments, forecast errors by international organizations concerning the impact of fiscal consolidation on GDP were significant and widespread in the advanced countries. In other words, fiscal multipliers in the crisis period were substantially higher than those assumed by forecasters on the basis of estimates performed in normal times. In this paper we address these issues in the case of the Italian economy. In particular, estimates of fiscal multipliers for the Italian economy are provided under the special conditions that marked the 2008-2014 crisis. These estimates are obtained on the basis of a traditional structural macroeconomic model (MeMo-It) used by the PBO for its forecasting and simulation activities. We start by performing a sub-period estimation of the model for 1970-2007, that is for the years preceding the crisis. We find that the fiscal multipliers obtained from this model estimation are generally smaller than the fiscal multipliers of the model estimated for the entire 1970-2014 sample period, i.e. including the crisis period. This is suggestive of an increase in the size of fiscal multipliers in the latter part of the sample period, involving the crisis years. Moving from this very preliminary evidence to a more precise statistical inference of crisis-specific multipliers is a challenging problem with a traditional structural model. This is because, by construction, estimates of fiscal multipliers in these models do not change with changes in the state of the economy. This problem could be overcome by directly estimating fiscal multipliers specific to the crisis years only if the period examined were sufficiently long to allow a reliable econometric inference. This is clearly not the case for 2008-2014. The approach adopted in this paper resolves this issue. More specifically, we show that through the inspection of stability of the structural parameters and sub-period estimations, these models can provide relevant information about changes in the size of fiscal multipliers in the crisis period. Indirect estimation of fiscal multipliers for the crisis period (2008-2014) on the basis of the construction of variance-based weighting schemes of the estimates. Although uncertainty is inevitably large in this kind of estimation, it is nonetheless possible to demonstrate that the size of the multipliers of the crisis period (2008-2014) is in general significantly larger than those for the pre-crisis period (1970-2007), both on the expenditure and the revenue sides (Tables 1 and 2). These results appear to be consistent with the findings in the empirical literature, which show that multipliers in especially deep recessions are larger than those estimated for normal times. According to the estimates in the study, the size increases more in the crisis period for multipliers associated with expenditure (they rise above 2.5 for investment expenditure and above 1 for intermediate consumption). 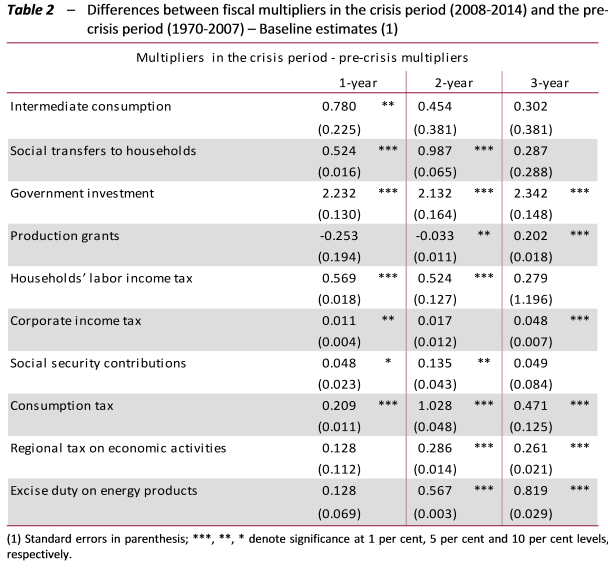 Statistically significant increases in crisis-period multipliers (which remain below 1, however) are also detected for expenditures on social transfers, direct taxation, social security contributions, indirect taxes and taxes on economic activities. Differences in pre- and post-crisis multipliers persist even after various sensitivity tests. The results for the Italian case confirm the general findings of the empirical literature for other countries about the increase in the size of fiscal multipliers in crisis periods compared with normal times. The crisis-specific fiscal multipliers are used to conduct a counterfactual exercise focused on assessing the effects on GDP of the fiscal consolidation programme adopted in Italy in the second half of 2011 for the subsequent three-year period. The goal is to evaluate, other things being equal, whether the use of the crisis-period multipliers would have reduced the forecast error for 2012-2014 produced using the fiscal multipliers of the basic econometric model. The forecast error for changes in GDP is broken down into three components attributable to: a) a revision of international exogenous variables; b) the underestimation of fiscal multipliers; and c) other residual factors. 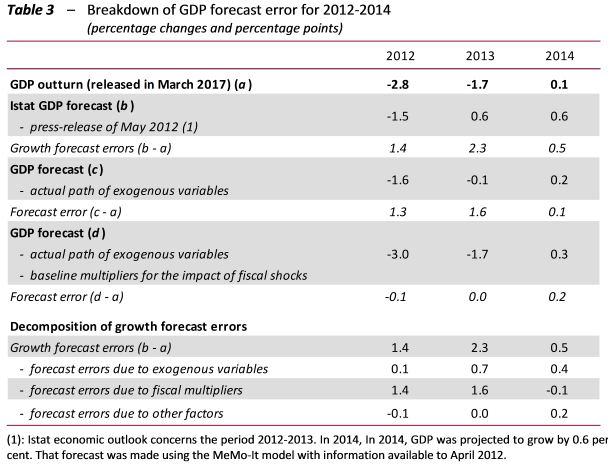 The simulation results, even with the limits connected with an exercise in comparative statics, show the decisive role played by the underestimation of the fiscal multipliers in increasing the forecast error (Table 3). The use of the fiscal multipliers estimated for the crisis period tends to cancel the prediction error for 2012 and reduce it by about 70 per cent for 2013. Robustness checks, performed by applying alternative estimates of the crisis multipliers obtained with the same approach, confirm the finding of a significant reduction in forecast error for the 2012-2014 period. Blanchard O. and Leigh D. (2013), “Growth Forecast Errors and Fiscal Multipliers”, American Economic Review: Papers and Proceedings 103(3) 117-120. The PBO conducts its annual estimates using the MeMo-It forecasting model, which was originally developed by Istat and is used under a framework agreement with that institute. See, for example, Arin, KP, Koray, F. and Spagnolo, N. (2018), “Fiscal multipliers in good times and bad times”, Journal of Macroeconomics 44 (2015) 303–311; Coenen et al. (2012), “Effects of Fiscal Stimulus in Structural Models”, American Economic Journal: Macroeconomics 4(1): 22–68.